You are here:Home Creativity Is Procrastination Good for Your Creativity? Are you familiar with the habit of waiting until the last minute to finish a project? Are you suddenly more willing to clean the house when you have a big deadline approaching? You want to go outside and have fun. Do you feel the urge to read several inspiring articles before you start working on that project? Or maybe do a Netflix binge? I know this feeling, and when I was younger my room was always very clean and organised when exams were coming up. Some people are like this while others are better at starting right away and work on a project at a steady pace and finish in no rush. But how are those two approaches to finish a project different regarding creativity? Which one is better for your creativity? Before we talk about whether it is better to procrastinate or not for increased creativity let’s procrastinate a bit and look at pictures of two brains, one of a procrastinator and the other one of a non-procrastinator. These fun pictures are from Tim Urban, he wrote a great article called Why Procrastinators Procrastinate with these illustrating pictures. As you can see, the difference is the instant gratification monkey. Many don’t like it that they procrastinate big projects, they wish they had the discipline to do things that make sense and think long term. But when we look at creativity, does this instant gratification monkey influence people’s creativity in a good way or a bad way? 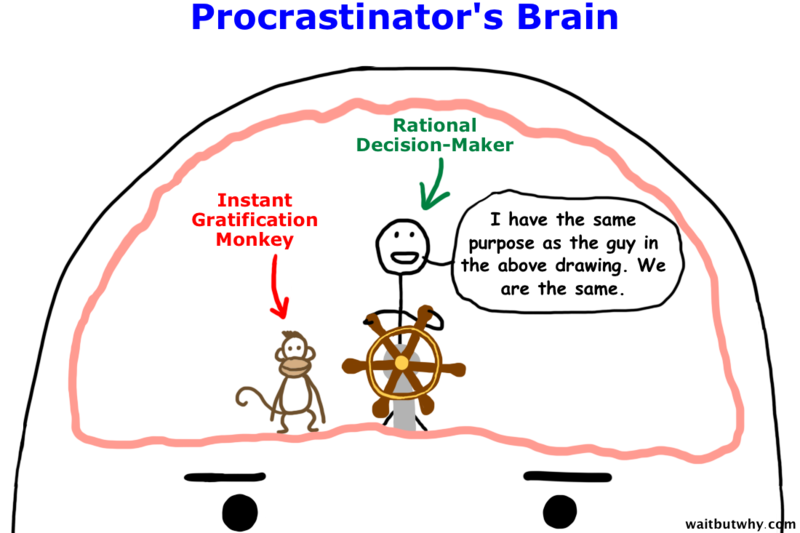 The good news is that based on a study it can actually be very good to have an instant gratification monkey in your brain that encourages you to procrastinate. The monkey is doing a great job increasing people’s creativity, well, when it is not in too much control. Adam Grant, is the author of the book called Originals and he is a professor at the Wharton School of Business. Jihae Shin was Grant’s student and she conducted a survey where students were divided into two groups, both groups were asked to write a business proposal, but one group was asked to procrastinate and start the ideation later while the other group was asked to do it right away. 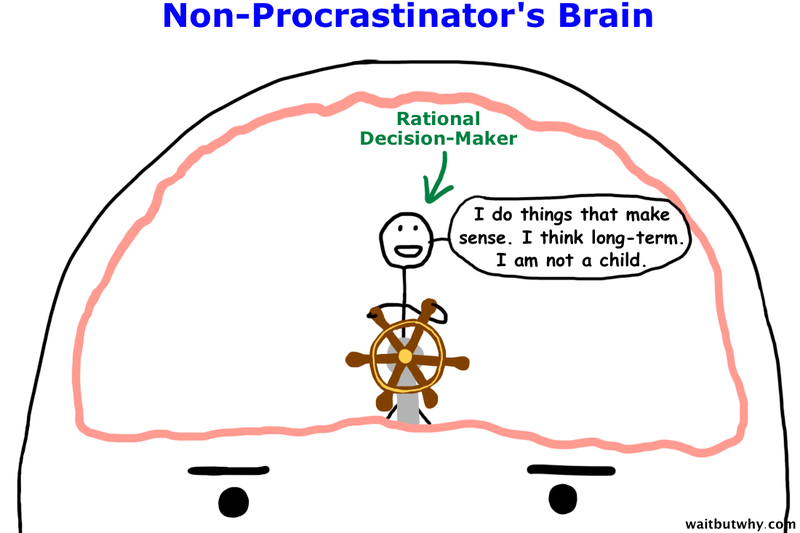 The proposals were evaluated based on their creativity and the results were that the procrastinators group was found to be 28% more creative. This study was followed up by an experiment where participants were asked to come up with a business idea and some participants were asked to play a video game before they started generating ideas while others were asked to start right away. The ones who procrastinated after knowing about the project of coming up with a business idea were more creative than the other group who started right away. The key is to know what you want to do, in this case come up with a business idea, before you start procrastinating. Our initial thoughts are often the most conventional ones, but procrastination gives space for a person’s mind to wander, and that can lead to more creative ideas. However, it is not good to procrastinate too much. Grant talks about this in his TED talk and he mentions that even though it is not good to race into a project as soon as possible it is not good to wait until the very last minute either, there is this sweet spot in between. Now that you know that procrastination can actually be a very good thing for your creativity you might be thinking how to procrastinate successfully. On wikiHow, you can find a list of 11 things to keep in mind when you are procrastinating.